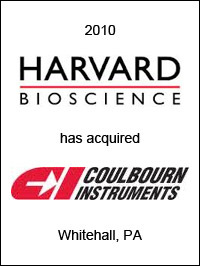 Harvard Bioscience, Inc. (Nasdaq:HBIO), Holliston, MA, a global developer, manufacturer, and marketer of a broad range of tools to advance life science research and regenerative medicine, has acquired the business of Coulbourn Instruments, Whitehall, PA, through a purchase of substantially all of Coulbourn’s assets. Coulbourn Instruments is a privately held manufacturer of behavioral measurement products, with a strong focus on systems for assessing learning and memory utilized in research laboratories. EC Mergers & Acquisitions advised Harvard Bioscience on this transaction.